After a long day in Liverpool competing in the leading event, I travelled to Manchester to compete at The Depot Climbing Centre, a brand new centre with loads of space and a variety of gradients. I arrived 2 hours before qualifiers began and took time to look at the blocks and get warmed up. There were lots of slabby problems with twists-a slippy foothold perhaps or even a dyno- as well as some powerful blocks. Going around with some mates I managed to flash a slab and then one which came through a small roof. However the hard blocks far outweighed the easy ones, and I had trouble getting past the bonus on a fiendishly hard slab, a shouldery, bridging problem and a slab with a dyno to a tiny pocket. There was one problem which I suspect I could have done had I not messed up all of my attempts. The first go I grabbed a hold which looked the same colour as the block but apparently wasn't. The next two attempts my hand slipped just as I was setting up for the side ways dyno to the bonus hold. This made me frustrated, but I didn't let it get to me and I found a steep problem which I managed to get second go (see picture). The eighth problem was a huge deadpoint which I couldn't make. I was thrilled to qualify in 4th behind 3 members of the GB Bouldering team and sat back for a bit to watch the youth C and B finals. Isolation was busy (as always!) but I managed to warm up well and kept warm with my new fleece from Berghaus. In observation I read our 3 blocks carefully with some mates. Our first block was my worst nightmare-a huge dyno to some volumes was the crux! Unfortunately I didn't get anywhere on this but I wasn't alone-only one girl in my category got it. I could do the first few moves of the second block, pulling up to a sloper and deadpointing to a crimp on a volume, then going again to a positive sloper. However, the move to the bonus was a huge rock over on a high heel and, getting to this point 3 times, I just couldn't reach it. By this time I was beginning to think the results would come down to qualifier results as no one had got the bonus on the 2nd block either. 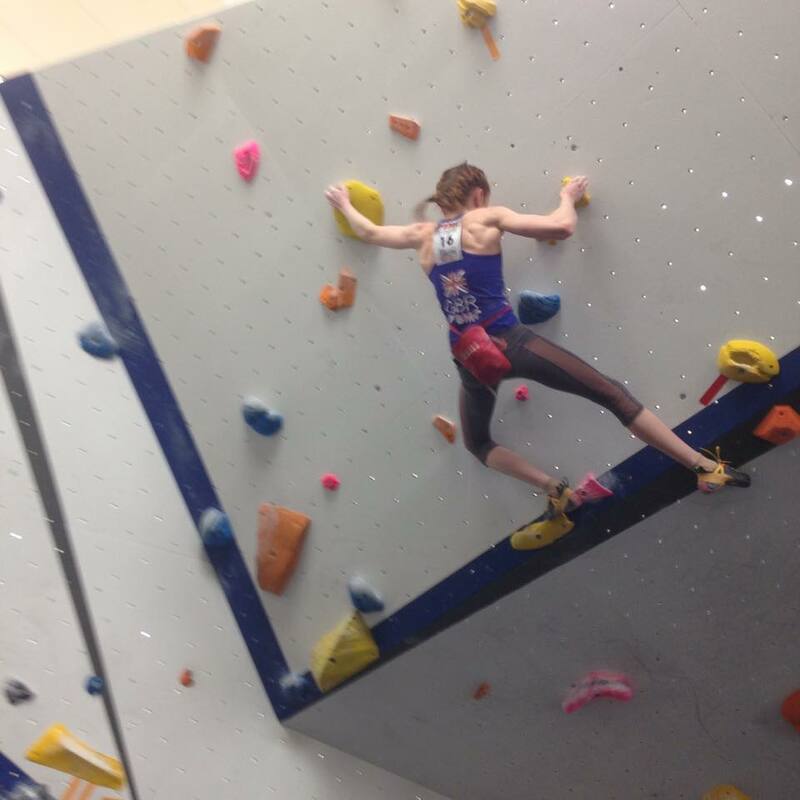 The third and final problem was much more do-able, with a tricky start position (which I slipped of twice!) but then some good holds and a precise throw to the bonus, followed by undercutting a pinch, going to a sloper then throwing to a block hold and holding the swing, before launching for the last hold. However, I got to this point twice but couldn't reach the last move-perhaps if I'd had it as my first block I would have topped. Again, only one girl in my category topped which left the rest of us separated only by the number of attempts it took us to get to the bonus, with two girls not getting the bonus and coming 5th and 6th. Unfortunately for me this meant coming 4th even though I'd been the only one of the 3 of us who tied to get to the last move of the last block. I had fun anyway, and was really pleased to come 4th in such a competitive field in my less favoured discipline. Well done to everyone who competed! Last weekend on the 5th March I arrived at Liverpool Awesome Walls to compete in my first lead comp of the season and the first comp in which I would be representing the GB Team. This was exciting, although I felt nervous as I knew people would have high expectations of me. On arrival I was told I could collect my new team kit from Berghaus. It came as no surprise that the kit was much cooler than previous years as I knew Berghaus were a huge company producing quality goods. My favourite item is the branded down jacket! After the initial excitement of trying everything on, I felt shaky again so went to warm up and watch my demos. Both of my qualifiers were technical with a slight overhang and larger overhang at the top changing to vert for the last few moves. 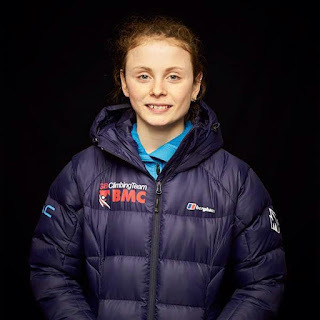 Pulling on to the wall for my first route I felt a roomful of eyes turn to the Union Flag on my back and I knew I had to do well to prove my worth. After a few sketchy moves at the beginning, I reached the top section where others had been falling. Coming over the overhang on to tiny crimps got me pumped but I managed to keep my head and topped the route, being one of two in my category to do so. This made me a little more relaxed and I went to have my team profile picture taken with a smile on my face. The next route look slightly harder as I had never used a lot of the holds before. After watching one of my fellow GB Team competitors fall low down on the route, I prepared myself for some difficult climbing. The first part was sketchy, with some strange holds which I didn't quite know how to hold. Reaching the place where others had fallen, I took care chalking up and just kept climbing. Coming over the overhang I had to lock off and reach as far as I could, grabbing the next hold with two finger tips. Unfortunately the hold was shiny and as I brought my foot up my fingers pinged off and I fell, slamming into the side wall and hitting my back. Nevertheless, I knew I had done enough and I soon discovered I had qualified for finals in 2nd place. Isolation, to my annoyance, was in a small Boulder room which had a ceiling you could touch from the ground and a lack of poor holds for warming up. I spent time catching up with others in the cramped quarters and soon it was time for observation. We had been given the same route as 3 other categories, a pumpy route on the comp wall which arched out into a near horizontal section, then curved on to a vertical part to the end. After a long couple of hours spent keeping warm in isolation, it was finally time for me to climb. The first part of the route was on smallish holds, moving into jugs through the roof. I chalked up on the last jug and powered over the roof on to smaller crimps. This transition made me suddenly very pumped and when I cut loose I thought I would fall. However, the crowd kept roaring and I didn't give up, only falling when I grabbed a hold with the wrong hand to clip and was too pumped to switch hands and move on. I was slightly disappointed to come third, as I often do and I had qualified higher. However, I was still pleased with my climbing. Congratulations to everyone who competed!